Plans for a new tertiary education facility at the Darwin Waterfront have been unveiled by Charles Darwin University in partnership with the Toga Group and the Northern Territory Government. The purpose-built, five-storey CDU Business School will be located in Building 4 of the Wharf 2 complex. CDU Vice-Chancellor Professor Barney Glover said the world-class Business School would be the new home for about 600 students studying Business, Hospitality and Tourism. 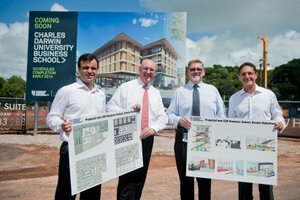 “With construction underway, the international-standard business school is expected to attract enrolments from not only the Territory, but also from across Australia and overseas,” Professor Glover said. He said the top three storeys would be devoted to teaching and research and would include a circular 130-seat lecture theatre, situated in a function space. “The facility will support contemporary teaching and learning practice, and will include IT-intensive flexible teaching and tutorial spaces for students, supported by extensive student study and collaborative spaces,” he said. The building will also include a Vocational Education and Training Virtual Enterprise to prepare young people for the workforce. “The new facility will underpin an expansion of our VET training,” Professor Glover said. The Business School will open in 2014, offering degrees and diplomas across a range of courses including new programs in hospitality, hotel and event management and tourism.